Recorded as Cadde, Cade, Caddie, Caddy, Caddies, and others, this unusual name has a number of possible sources, each with its own distinctive history and derivation. Firstly, it may be of Anglo-Saxon origin, representing a rare survival of the native Olde English personal name or byname "Cada", from an Old Germanic root word meaning "lump", and possibly applied to a stout, plump person. The given name is also found as the first element of the placename Cadbury. Secondly, the surname may be of Old French and early medieval English origin, and an occupational name for a cooper, from "cade", meaning cask or barrel. Finally, the surname may derive from the Middle English "cade", meaning a domestic animal, specifically often used of a young animal left by its mother and brought up by hand as a domestic pet; in this instance the term was used as a nickname for a gentle, inoffensive person. Early examples of the name include: William le Cade (1327, Sussex), and Richard Cadde (1327, Worcestershire). 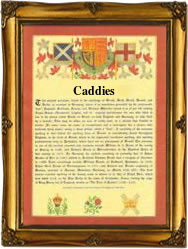 The surname Caddie, Caddy or Cady is also found in Scotland, where John Cady, tenant under the earl of Douglas in 1376, is the first of the name recorded. In London, the marriage of Nicholas Caddy and Ann Addinet was recorded at St. Mary Mountham, on July 16th 1621. A coat of arms granted to a family of the name depicts, on a silver shield, three red piles meeting in point; on a red chief three gold garbs. The first recorded spelling of the family name is shown to be that of William Cade, which was dated 1140, in "Archaeological Records of Kent", during the reign of King Stephen, known as "Count of Blois", 1135 - 1154. Surnames became necessary when governments introduced personal taxation. In England this was known as Poll Tax. Throughout the centuries, surnames in every country have continued to "develop" often leading to astonishing variants of the original spelling.